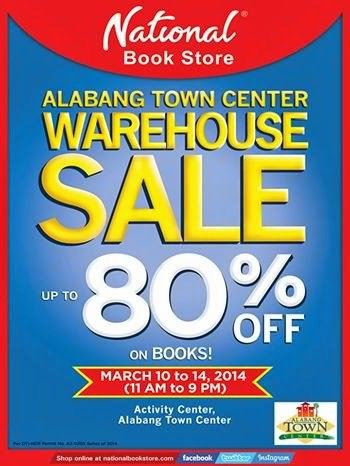 Two days ago, we visited National Bookstore's Warehouse Sale in Alabang Town Center. There were lots of people, but good thing there was still room to browse through their selections. Baby books for Kali. Selection was limited though so I had to grab what I see. These sell for Php10-Php20 each. Kuya got a book for chess. Ate got Glee and a Disney book. She got a green notebook too. I got my husband a diet cookbook and Europe's Top 10 Cities guide. 1) Don't expect to find something you're looking for in particular. The books are grouped by their discounted selling price, so categories are mixed with one another. You need to be quick to browse through hundreds and hundreds of books. You will see books you are not familiar with, so your purchase will depend on your quick 3 to 5-second read through the book's summary and highlights. The kids and I went to several areas on our own so we can find the selections we want. This way, you can each take home books that interest you. It was definitely a great shopping buy! I love your loots especially Chess book!